Volunteer on Weekends with your Friends, Family or Colleagues! While these benefits have been repeatedly proven and extolled, there are several more little-known ones, which tend to be more personal. An uncontested one though, is that volunteering is seen to be a great use of one’s time. At ConnectFor, we think we’ve come up with a win-win solution for people to be able to achieve their goals without having to compromise on their time. We all have a certain time we set aside for social activities – to spend time with friends or acquaintances doing recreational things every now and then. We propose to make volunteering a recreational activity well suited for social groups! In earlier times, people viewed volunteers as some who might be sent out to get coffee, or make copies. However, over the past few years, volunteering options have expanded and the goal has now become to help volunteers contribute and grow along the way. As a student, you have very few chances to contribute meaningful ideas that make a difference. As a volunteer or an intern, you are given the opportunity to share ideas and make a difference. You will contribute to making a positive social change. Additionally, working alongside people who feel as strongly as you do about supporting a particular cause creates a path for developing strong relationships with others. Gaining real-world experience helps everything from improving the volunteer’s chance of impressing potential employers, to make sure they have skills that they can use to ensure success when they start a new job. Volunteer work gives students a chance to gain these skills while they are still in school. There is a certain level of accomplishment when you take the knowledge you learned in class and apply them to “work”. Your education reinforces the fact that these theoretical theories and concepts that your teachers keep telling you are actually useful in real life. Volunteers have invaluable access to colleagues at different levels all in an industry that they are considering as their future career path. This is when you “get your feet wet”, or try different types of careers when you have the opportunity to do so. Volunteering is also an awesome opportunity to network and meet new people! You will be surprised to the kinds of people you end up a meeting, and connecting with! This past Summer, I interned with ConnectFor for about six weeks. Before applying, I was a bit hesitant about applying anywhere. But, I did it! That feeling at the end of my summer was….unbelievable. I realized that not only did I help the community I served, but it made me feel good. It helped me try something new (like writing this blog!) and allowed me to believe in myself by allowing me to expand my knowledge, skills, and talents. Have I convinced you yet? Also, look out for updates on upcoming volunteering opportunities on https://www.connectfor.org/. I promise you-you will not regret this decision! Hi! Welcome back to ConnectFor — we know you’ve been waiting for our next blog, so here it is. Today’s blog is a bit of a throwback. How? Let us tell you how ConnectFor got started, and the impact we’ve made since! Our journey began three years ago when ConnectFor was launched in December 2015. ConnectFor was started with the hope of connecting people to non-profit organizations that have already been doing inspirational work, enriching the lives of those in need. We strive to ensure that volunteers are matched to NGOs based on their respective talents, skills, and interests. We believe that all the volunteers that have signed up through ConnectFor are motivated by their personal interest, curiosity or potential for professional development. Volunteers believe that by giving their time to a worthy cause, they are serving as contributing members of society. The top 3 categories of volunteering are teaching, social media design, and/or administration and business support. Most of our volunteers are students or young working professionals between the ages of 21 and 30. 58% of the volunteers have 1–7 years of work experience. 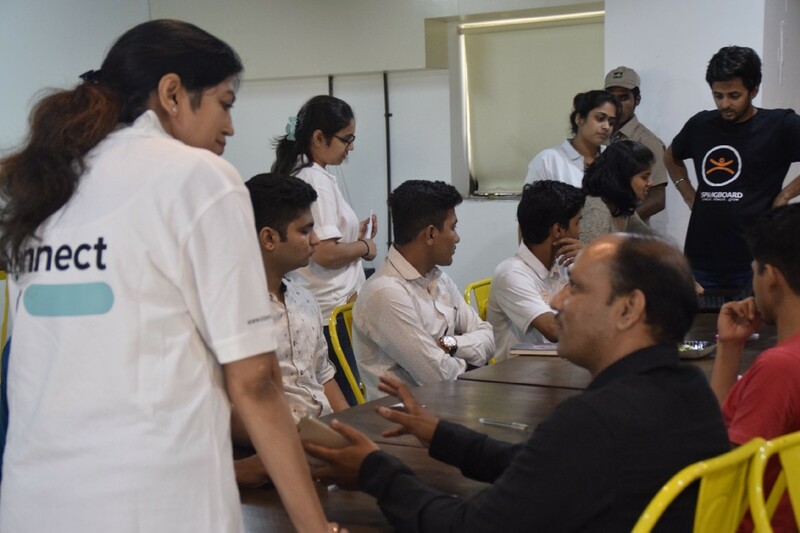 They can bring professional skills they have developed in the workplace like project management and team building, and apply it through volunteering with an NGO. 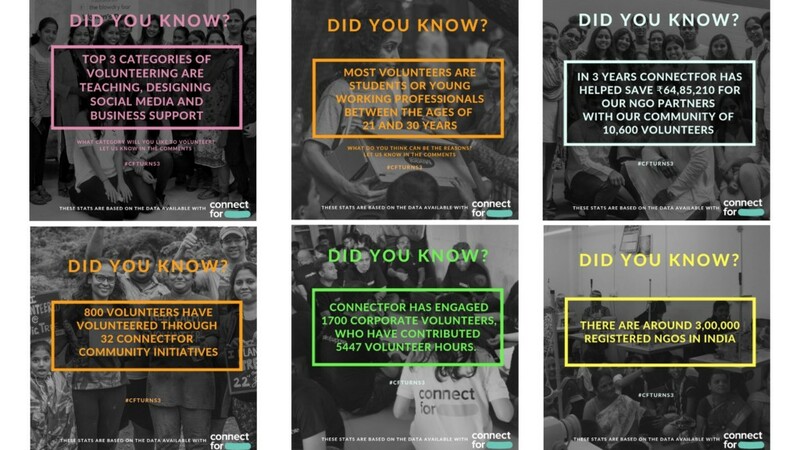 Since the past three years, ConnectFor has engaged 1964 corporate volunteers, who have contributed about 27184.5 hours! Did you know that 800 volunteers have volunteered through 47 community events (these events vary from Tree Plantation Drives to Blood Drives). The power and impact of volunteering through ConnectFor goes well beyond time spent. Our volunteers have not only contributed hours, but also contributed economically by saving costs. A ConnectFor volunteer helps an NGO save about Rs. 2,614. Cumulatively, these volunteers have given more than 20,000 hours of volunteering and saved NGOs more than Rs. 6,000,000. These numbers depict the impact volunteering can have for NGOs and the need for human resources to help these organizations achieve their selfless goals. Our journey at ConnectFor does not stop here. Our journey at ConnectFor has always been one of growth, and it will continue to be so. 3 years later and 3 cities later, we are excited to see what’s coming up! Here are some volunteering facts that we have come up with over the years! So what is stopping you? Come join our community and start your volunteering journey today. ConnectFor Tri-City Beautification – We turn 3! 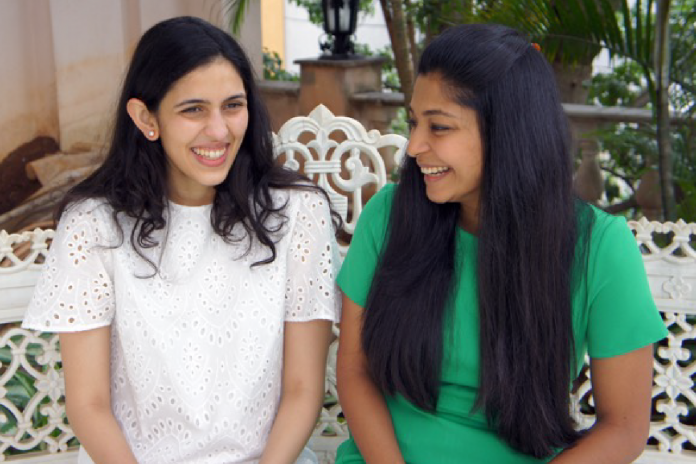 Three years is an exciting milestone which we would not have been able to achieve without our devoted founders Shloka Mehta and Maniti Modi. ConnectFor’s journey began when our founders were modeling an idea that provided an accessible platform to engage with the volunteering community. 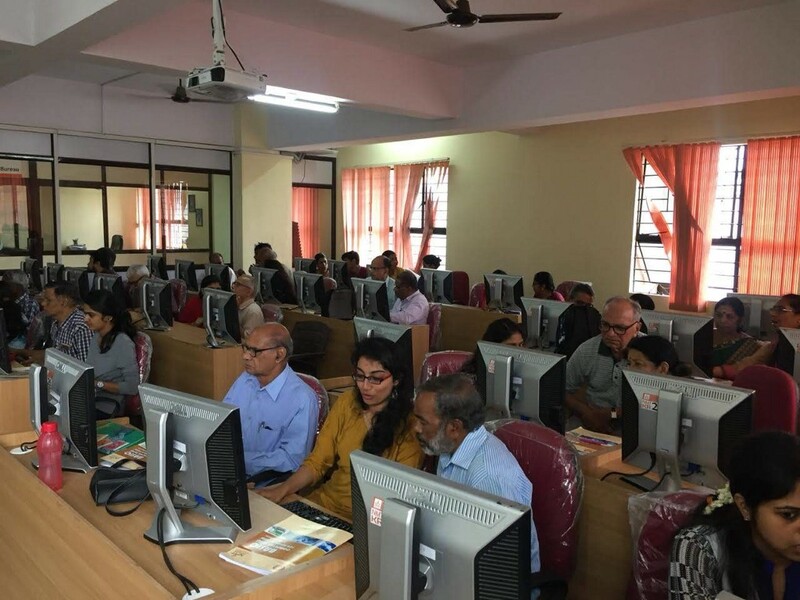 They were able to move forward with ConnectFor’s launch in 2015 on the hopes to build an online volunteering platform that connects individuals to various NGO’s and corporate organizations across the nation. In 2018, they led ConnectFor to demonstrate the value of human resources for non-profit organizations and/or corporate organizations, by creating high-value matches based on an organization’s needs, and an individual’s time, skills, and interests. 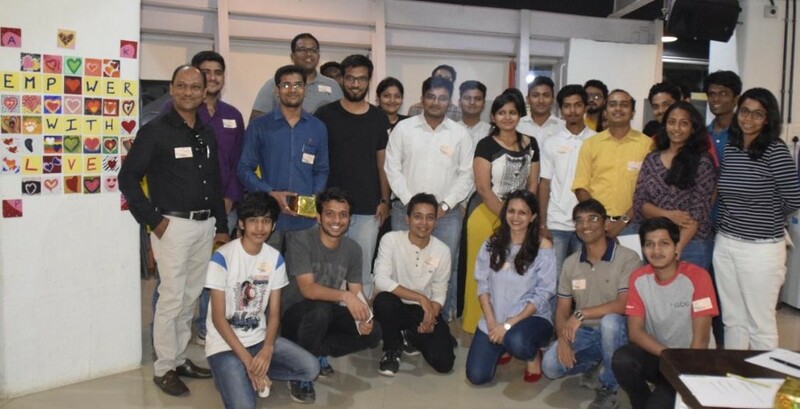 After three years of hard work, dedication, and perseverance, ConnectFor is proud to be in three progressive cities: Mumbai, Bengaluru, and Pune. 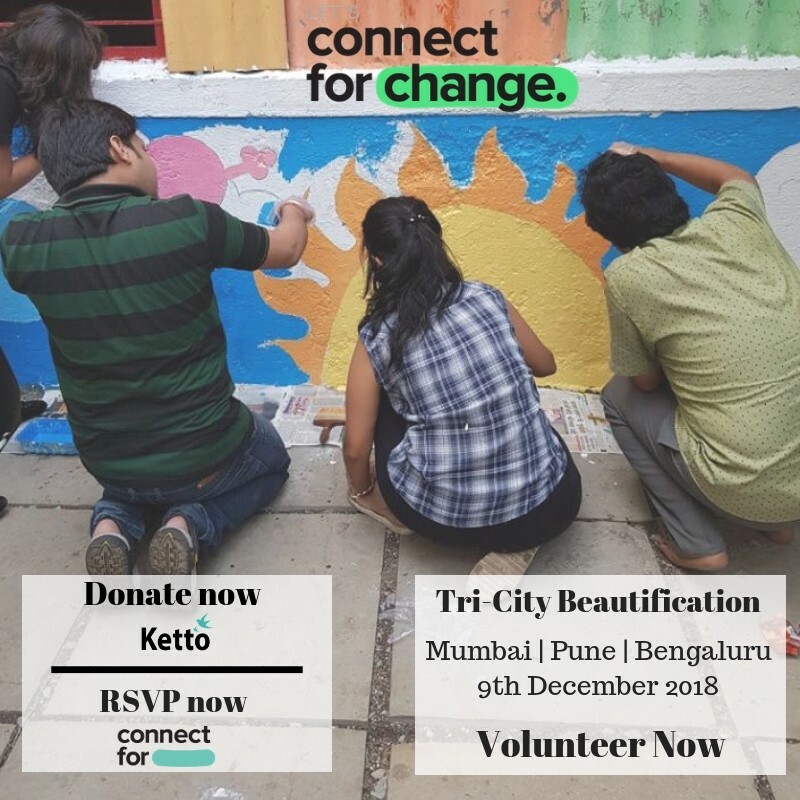 To commemorate ConnectFor’s 3rd birthday we are giving back to our host cities by hosting beautification campaign across Mumbai, Bengaluru, and Pune on December 9, 2018, from 9:30am-1:00 pm. We would love for you to be part of this celebration! We strongly believe that communities are meant to create connections, opportunities, and a sense of belonging. A city beautification campaign is a great way to build thriving communities as volunteers work together towards achieving a common goal. We want our volunteers to come together to create an enriching and vibrant space for each individual of the community. In Mumbai, we will be collaborating with local railway authorities to paint a railway station. In Bengaluru, we will be working to uplift a public garden, and in Pune, we will be working towards uplifting the main road. Volunteers are encouraged to bring along their friends and family members and work together to create a better environment. If you cannot attend this event but would like to donate to raise funds for the event, you can support by donating on this link — https://bit.ly/2zxJxej. ConnectFor is looking forward to celebrating its third birthday with all of you! Our volunteers have been integral to our growth and success. We have just a few spots left so we encourage you to sign up as soon as you can! In Pakistan, Nighat Dad helps young women fight online bullying and harassment. In France, Romain Lacombe is creating tools to help people track air pollution. In India, Ajaita Shah is increasing access to reliable, affordable, clean and safe energy products to the underprivileged through sales and service outlets. While these individuals support varied causes they have one vital thing in common; They are young change makers working to improve the world we live in. As young people get older, they are able to stretch their abilities. Children and/or adults engaging with others in meaningful service activities can encourage growth and development in a variety of ways. Empathy is the most important feeling to have when responding to the needs of others. We need to be able to imagine what other people may be going through or feeling. Volunteering help kids engage their natural empathic sense, but they must also be able to talk about the purpose and experience of the respective activity they are partaking in. Children are likely aware that there are people in need and causes that require our attention but are unsure what role they can play in improving the lives of the less fortunate.Volunteering can provide an experience that affirms a young person’s sense of self that they can make a difference through their own effort and skills. These kinds of experiences can empower young people to apply themselves in schools, and other organized activities. Social skills are learned best in social situations. When children come together to engage in meaningful tasks, communication and collaborations rise to the surface in a supportive manner. Volunteering also provides a great opportunity for parents and children to work and learn together. Giving students the opportunity to discover new Fields of interest really sparks a passion for learning and doing. Students often begin to discover, and find meaning in other activities. Partaking in community service teaches students the importance of investing in our community and the people who live in it. Not only do we want our kids to be successful in the future, but we want them to understand what it means to be a good citizen. Volunteering is more than just spending one’s time actively participating in selfless acts that benefit others. It has a much greater impact on society as a whole. Parents and schools should work together to inspire volunteerism among children. They will grow up as well-rounded individuals that are competent, socially aware, and useful members of society. Children’s’ Day, approaching on November 14, 2018 is a great place to start! The gift of inner peace is the best gift to give this, and every Diwali! Diwali is just a few days with numerous celebrations involving, shopping, gifts, decorations, and get-togethers. Receiving gifts are always satisfying but this Diwali, let’s decide to “gift” ourselves something more meaningful than conventional presents. Let’s capture the essence of Diwali and purchase gifts from talented young adults from NGO’s across the city. They offer an array of items such as torans, paintings, wall hangings and much more! So join us in making a difference this Diwali and making it a celebration of hard work and generosity.In order to make a significant difference, let us all encourage people to buy handcrafted Diwali items from various NGO’s listed below. There are six different NGO’s that have worked hard to ensure all your needs are met. These handmade items will not only have a longer life than conventionally made products but are also eco-friendly in nature. A great opportunity to reward those who put in the time and effort to make these gifts. You will find everything from coasters to wine bags to chocolate modaks! So, click on any one of these links, and check out what’s in store for you! A difference can also be made by buying new toys and donating old ones. Donating toys can bring a sparkle to the eyes of millions of children and provide every child with an opportunity to enjoy the festival. You can start by donating your old toys to schools, hospitals and other relevant organizations. The best way to give back to society is by giving your time. Volunteer work can help strengthen our community as it allows you to grow as a member and as an individual. You can choose a service or NGO via ConnectFor and volunteer your time for a worthy cause. As Diwali is a celebration of lights and devouring delicious treats, let’s give every individual an opportunity to savour the moment. You can cook, share and celebrate Diwali at an orphanage and enjoy a meal with them. No feeling is more satisfying as making Diwali treats for everyone! You can also cook along with the children and create precious memories. We hope that everyone puts in an effort to make Diwali special for every member of society. It is a blessing that we have the scope to put a smile on every child’s face and give back to society. Let’s all work together by purchasing gifts from NGO’s, donating our time and money to the less fortunate and celebrate this auspicious festival with inner peace. From everyone at ConnectFor, we wish you a very happy, prosperous, and peaceful Diwali! Have you ever wanted to volunteer and give back but felt that you did not know how to contribute effectively? Or maybe you were a bit worried that your opinions on prevalent issues would not be considered? Well, you were wrong! Being involved in community engagements is a great way to give back! At ConnectFor we believe community involvement is vital to help address and resolve societal and environmental issues, which is why we have curated a range of events you can volunteer at this year. Participating in community events is a great way to give back to society and support causes that are dedicated to improving the lives of those in need. It is essential for us to make time in our busy lives to do our part in leading the change through communal activities. Believe it or not, volunteering has its perks. It can help reduce stress, enhance your professional career, and give you a sense of purpose. Volunteering does not necessarily have to be a long-term commitment, giving a small amount of time from your busy schedule and helping those in need can improve your health and happiness. Let’s take a look at these benefits more in-depth. Improving others lives and giving back to society – The first benefit that you would derive on participating in a Community Engagement is that you will in some way surely improve their lives and back to the society in the smallest possible way by contributing just some amount of your time. Connecting with People – Community engagements provide you with the opportunity to meet and connect with people from all walks of life. Working together towards solving a common problem instills a sense of comradery between volunteers, often result in long-lasting friendships. A great opportunity to get out of your comfort zone and interact with like-minded people working towards the betterment of society. Strengthening your body, mind, and soul – Volunteering strengthens your body, mind, and soul. Help improve your state of mind by decreasing stress, anger and anxiety that many of us deal with in our lives. The idea of helping and being there for others is a type of feeling that will help decrease your stress. You are making a meaningful connection with another person, something that you probably won’t have a chance to do so often. Additionally, doing good for others and the community will provide a sense of accomplishment, and will increase the confidence of a volunteer. Career Growth – Volunteering can help grow your professional career and bring growth to your career. If you’re in the process of switching jobs or want a break to do something different-volunteer! By volunteering with different people and NGO’s, you are broadening your horizons and experiences. This might help you figure out what you want to do next! Furthermore, volunteering gives you the opportunity to practice important skills used in the workplace, such as teamwork, collaboration, communication, problem-solving, and organization skills. Bringing Joy into your Life – Volunteering can bring joy into your life. Volunteering is an easy way to explore your interests and passions. Just like how volunteering can bring advances to your career, finding the fun in volunteering can help people find peace and a purpose to live. When you partake in volunteering, you will find it meaningful and interesting. Volunteering can be relaxing and can energize and motivate you from your day to day routines at work, and/or school. We believe that being involved with our local community is all about building relationships: with the community, leaders, various businesses, and most importantly, with the citizens of those communities. We believe that it is our responsibility to serve, connect, and celebrate our community, and to do this we need you! Have we convinced you to participate in community events yet? We hope we have! If you are not sure where to start. Well, we’ve got the answer for you! Register on the website: www.connectfor.org, and stay tuned for more community events happening around you. Make sure to sign up, and make a difference in someone’s life! Join us on 19th October for DIY — Diya It Yourself. Give your time this Daan Utsav and make a difference! ‘Daan’ and ‘Utsav’ are two words that describe our Indian Culture extremely well. Daan Utsav, also known as ‘The Joy of Giving Week’ is a Festival celebrated in India every year from 2nd October to 8th October. Launched in 2009, Daan Utsav celebrates the spirit and joy of giving. The festival encourages and empowers millions of people to give back to society in any way they can. It represents breaking down the conventional stereotype of philanthropy, by focusing on the simple act of making someone else happy. This act of giving can be anything from time, money, materials, necessities, or love! Daan Utsav is a volunteer-driven initiative executed by a passionate group of volunteers who manage the activities of the festival. The festival sees people from all walks of life doing their part for the betterment of society. Its ideology is focused on allowing people to give back in any way they choose. No contribution is too small and every form of contribution is appreciated. Something as simple teaching your household help basic English or feeding a stray dog would be in line with the spirit of Daan Utsav. In 2017 millions of people participated in more than 1,500 events across 200 cities, raising considerable amounts of money, collecting material donations and volunteering countless hours. Be part of a movement that is dedicated to making a positive impact in people’s lives, an initiative where every small contribution makes a difference. 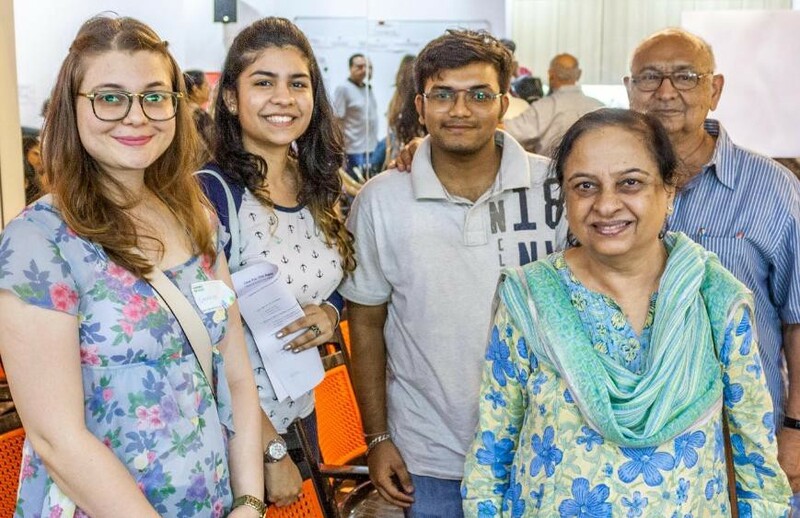 ConnectFor is looking for volunteers in Mumbai, to participate in this year’s Daan Utsav. If you live in Mumbai or are visiting during the week of October 2-October 8, please consider volunteering! More the merrier, spread the message of Daan Utsav by bringing a friend or a family member along with you. To RSVP, please click on the links provided below, and stay tuned for more updates! Along with this ConnectFor is hosting a number of Donation drives across Mumbai. These drives serve as a great opportunity to positively impact the lives of those in need, by donating items you no longer use. Here is a list of NGOs you can donate at. Muskurahat Foundation aims to bring about a smile on each person who dreams and wishes to fly. Here are some items they require — Notebooks, Storybooks, Encyclopedias, Science experiment books, Coloring books for small kids. Angel Xpress Foundation an NGO working to transform the lives of underprivileged children through regular access to educated adults. Here are some items they require — Hygiene products like soap, comb, shampoo, toothbrush, toothpaste, hand towel etc. in the form of a small kit. You can drop these items at the respective NGOs anytime between October 2 — October 8, for exact addresses or if you have questions, please feel free to reach out to ConnectFor at +91 79773 47851. Since giving back to our community can not be measured, even the smallest actions count. Do share your #SmallJoysofGiving moments with us on social media. Let’s connect for happiness! 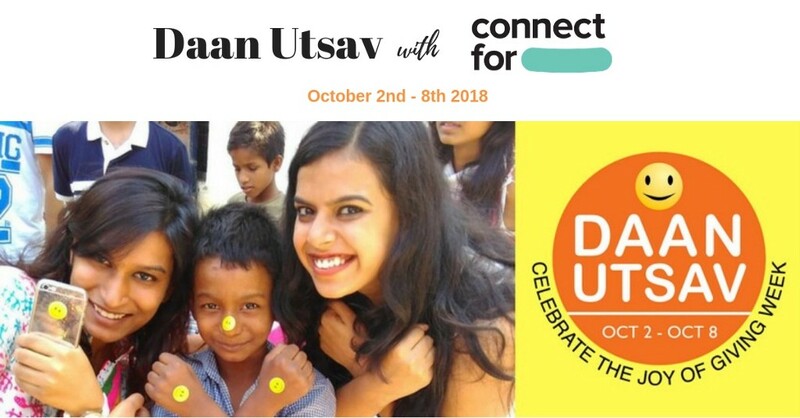 ConnectFor is looking for volunteers in Bengaluru, to participate in this year’s Daan Utsav. 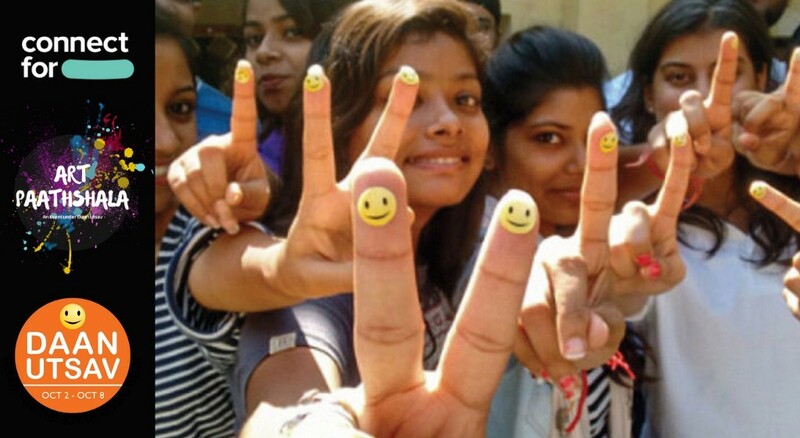 If you live in Bengaluru or are visiting during the week of October 2-October 8, please consider volunteering! More the merrier, spread the message of Daan Utsav by bringing a friend or a family member along with you. Along with this ConnectFor is hosting a number of Donation drives across Bengaluru. These drives serve as a great opportunity to positively impact the lives of those in need, by donating items you no longer use. Here is a list of NGOs you can donation at. Reaching Hand works with vulnerable children, marginalized women & deprived families empowering them to lead a life of hope, self-worth, and dignity. Here are some items they require — School bag, Notebooks, Geometry box, Pencil, Pens, Umbrella Water bottle, Drawing books, Steel Plates, Steel glasses. You can drop these items at the respective NGOs anytime between October 2 -October 8, for exact addresses or if you have questions, please feel free to reach out to ConnectFor at +91 79773 47851. 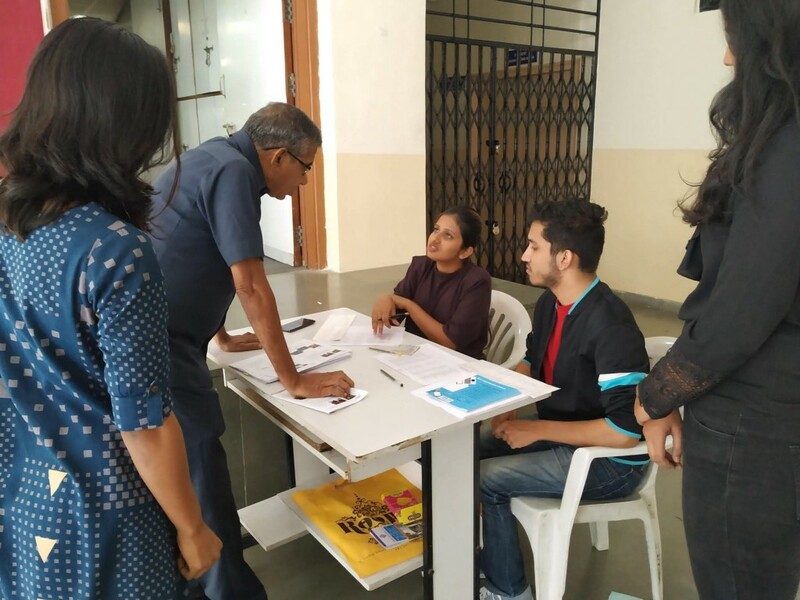 ConnectFor is looking for volunteers in Pune, to participate in this year’s Daan Utsav. If you live in Pune or are visiting during the week of October 2-October 8, please consider volunteering! More the merrier, spread the message of Daan Utsav by bringing a friend or a family member along with you. 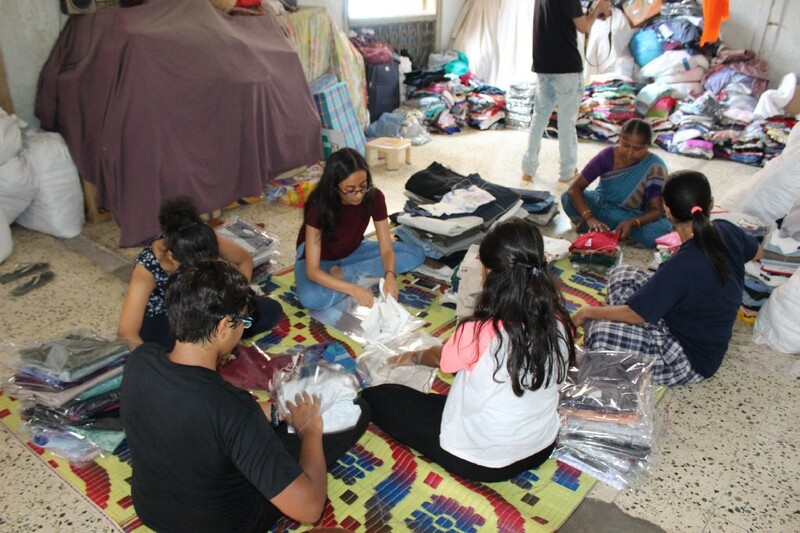 Along with this ConnectFor is hosting a number of Donation drives across Pune. These drives serve as a great opportunity to positively impact the lives of those in need, by donating items you no longer use. Here is a list of NGOs you can donate at. SNEH Foundation works to provide proper hygiene and high-quality education for the children living in the slums. Here are some items they require — Drawing books, Markers, Educational games, Storybooks, Liquid soap bottles, First aid kits, Craft material: colored papers, craft papers, sequins etc. Maher Ashram helps destitute women, children, and men from all over India exercise their right to a higher quality of life, irrespective of gender, caste, creed or religion. Here are some items they require – Rice, Dal, Wheat, Sugar, Jaggary, Cooking Oil, Rava, Poha, Salt, Bathing and Washing soap, Toothpaste, Ground Nut oil.